Monday - Friday, 11 a.m.-7 p.m.
We focus on customer service and are big on repairs and education. Our store prides itself on having the best staff of teachers in Olympia, Washington for all levels of play, from beginner to professional. Todd Connell is our certified Musical Instrument Repair Technician, with over 25 years repairing and providing professional setups to performance level for all stringed instruments. He is a participating member of Guild of American Luthiers and is passionate about bringing your vision to life when building a custom guitar or repairing your instrument. His expertise is with stringed instruments, but he is also experienced in repairing brass and woodwinds. He has been playing guitar for over 35 years touring locally, as well as, nationally. Currently, he plays the lead guitar, lead vocalist, and is a songwriter for the blues band The Wanderin Kind. 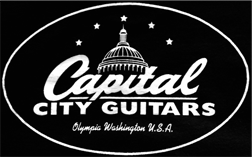 Capital City Guitars has been fortunate to employ a talented luthier such as Todd, whose creativity, insight, and mastery has customers returning for over 19 years to rely on his intuitive skill and crafting with their instruments. Chris Ward brings more than 30 years experience as a professional musician, instructor, salesman, and gear/tone enthusiast. Chris has toured nationally and internationally for many years, including with the longtime Northwest punk/swing band the Cherry Poppin’ Daddies. Chris holds a bachelor’s degree in jazz guitar from the University of Oregon and has also studied guitar at Berklee College of Music. Chris’s specialties include rock, blues, country, R&B, swing, and jazz. He is an accomplished resource for anyone looking to buy gear and/or who would like to learn or perfect their skills playing guitar or bass. You can find Chris in our store teaching, performing setups, or specific repairs customers request to match their needs and playing styles. CJ hails from sunny Los Altos, CA where he worked for many years as an electronics technician. 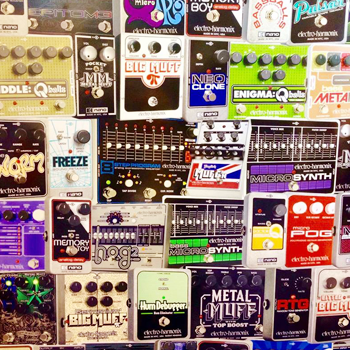 His love, for all things electronic, began in high school during an electronics class where he built his first guitar amp, a Fender Twin Reverb. He has been creating and repairing electronics ever since. If an amp has a blown transformer; transforming winding is a hobby that CJ can use that will be one of the best options to retain originality. He is unsurpassed in the Northwest for being the “Total Gear Repair Guru”. CJ can ‘fix them’, ‘mod them’, and he can ‘play them’. He is a master bass and guitarist, which is rare for an Amp Tech, which also gives him the insight and understanding from a player’s level. Need your repair done yesterday? Is your gear needed tonight? CJ has the fastest turn around on the planet. His talent and promptness will have your gear back to you quickly, and for emergencies, within hours. Bring all your gear repairs to this accomplished technician, to bring them back to original performance. Urban legend says CJ can make a distortion pedal out of a toaster! Tarik Bentlesmani is a Central Washington University graduate who holds a B.A. in Music. His expertise is guitars (specializing in classical and jazz), bass, and ukulele. With his music theory lessons, you will understand the practice and possibilities of music for your interests. Tarik’s professional accomplishments include Best Band of Olympia Award by Volcano Magazine, and Best Original Jazz Composition of the Year by the Northwest Jazz Society for his original piece. He has appeared on many recordings and has toured extensively. Tarik plays and teaches all styles of music from the young musician taking their first lesson to the college player building their expertise. As a soloist, he has developed an original technique that can produce chords, melodic lines, bass lines, and percussive sounds simultaneously. You will find Tarik playing solo or with his band, many nights in our area. Tarik’s devotion is to help you find the optimum equipment to match your style of playing whether you are an enthusiastic novice or a seasoned professional. His knowledge of instruments and his understanding of music will give you the insight needed when looking to purchase a new instrument or take a lesson to improve and build your technique. 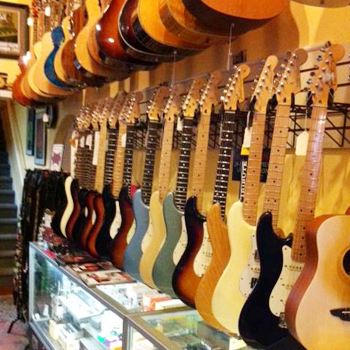 Robert Johnson is the owner of Capital City Guitars which he opened in 1996 and moved to Down Town Olympia in 1997. His passion for all things guitars began at the age of 8 when his parents purchased his first guitar in Germany in 1964 - an Acoustic EKO. His next acquisition was in 1971 when with the Help of His father he was able to buy his first Bass Guitar, a Fender Jazz Bass, which is still his Number 1 Bass. His appreciation of the guitar, coupled with his extensive research, has led him to be a known Collector Guitar Trader since 1977. Bob works with clients worldwide researching, buying, selling, and trading vintage, custom, and collectible guitars to fulfill their dream of purchasing the quintessential guitar to add to their collection. He has spent years working with professional musicians and equipping his store with gear that provides optimal performance when playing the professional scene. Bob also remembers the excitement and joy of purchasing his first guitar, and prides himself on taking the time to learn what you are looking for in a guitar, and then letting you experience playing guitars that fit your budget. He enjoys playing, participating in Olympia’s Arts Walk by showcasing bands in front of his store, and by living up to his reputation of paying you more money for your used and vintage gear, than anywhere else in the greater Puget Sound area. Rock On!